Biotinylated Human Siglec-3 / CD33, His Tag (CD3-H82E7) is expressed from human 293 cells (HEK293). It contains AA Asp 18 - His 259 (Accession # AAH28152.1). The protein has a calculated MW of 29.4 kDa. The protein migrates as 45-55 kDa under reducing (R) condition (SDS-PAGE) due to glycosylation. 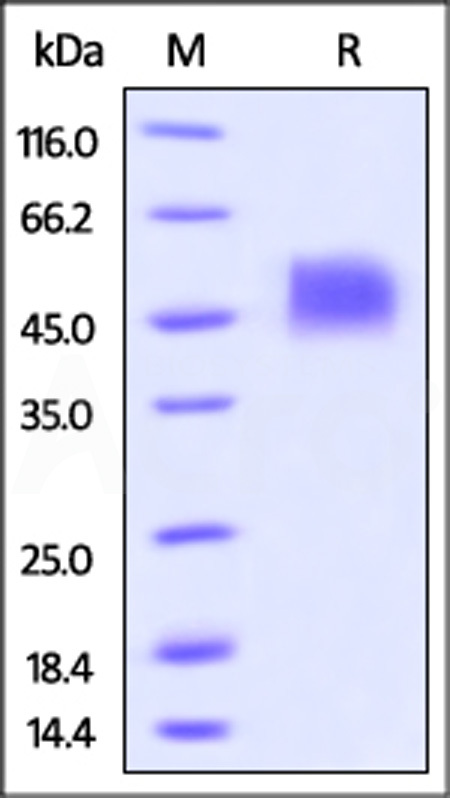 Biotinylated Human Siglec-3 / CD33, His Tag on SDS-PAGE under reducing (R) condition. The gel was stained overnight with Coomassie Blue. The purity of the protein is greater than 90%. 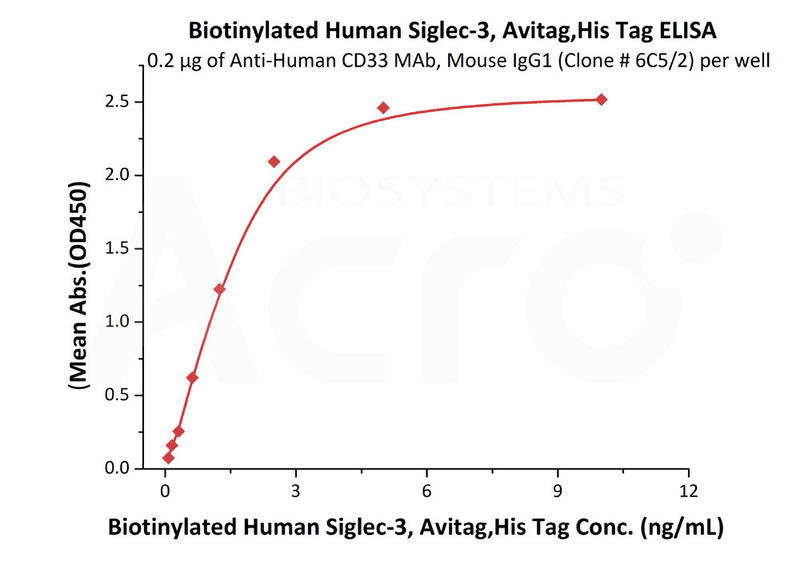 Immobilized anti human CD33 MAb, Mouse IgG1 (Clone # 6C5/2) at 2 μg/mL (100 μL/well) can bind Biotinylated Human Siglec-3, His Tag (Cat. No. CD3-H82E7) with a linear range of 0.078-2.5 ng/mL (QC tested). Myeloid cell surface antigen CD33 also known as SIGLEC3, Siglecs (sialic acid binding Ig­like lectins) and GP67, is a single-pass type I membrane protein which belongs to the immunoglobulin superfamily and SIGLEC (sialic acid binding Ig-like lectin) family. Human CD33 / Siglec-3 cDNA encodes a 364 amino acid (aa) polypeptide with a hydrophobic signal peptide, an N-­terminal Ig-­like V­-type domain, one Ig­-like C2-­type domains, a transmembrane region and a cytoplasmic tail. CD33 / Siglec-3 usually considered myeloid-specific, but it can also be found on some lymphoid cells. In the immune response, CD33 / Siglec-3 may act as an inhibitory receptor upon ligand induced tyrosine phosphorylation by recruiting cytoplasmic phosphatase(s) via their SH2 domain(s) that block signal transduction through dephosphorylation of signaling molecules. CD33 / Siglec-3 induces apoptosis in acute myeloid leukemia.